Jaevin Cumberland – ’15 Wilmington PG: After a huge weekend on the circuit, Cumberland earned an offer from Kent State. This offer from the Golden Flashes, makes a third school involved with Cumberland at the Division I level, as Army and Kennesaw State also are on the list. Winthrop offered two Ohio rising seniors in MaCio Teague (Cincinnati Walnut Hills) and Khalil Iverson (Delaware Hayes). Teague is one of TDP’s top ranked wing guards in the class, while Iverson is an athletic combo forward. 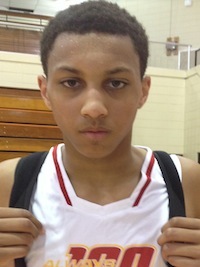 Jalen Avery – ’15 Cincinnati Shroder PG: Avery added another MAC offer to his list, this time from Kent State. Another point guard the Golden Flashes have shown interest in, Avery also has an offer from Miami (OH), as well as strong interest from Wright State. Elijah Pughsley – ’15 Lima Senior PG: The Queen City Prophets sharpshooter had some big games in Indianapolis, and earned his first Division I offer from Tennessee State on Monday. Noah Bramlage – ’15 Ottawa Glandorf PF: Playing for All-Ohio Red minus Esa Ahmad, Bramlage stepped up into a primary scoring role, and was impressive enough that Ohio University became the latest school to offer Bramlage, who holds near twenty scholarship offers. Esa Ahmad – ’15 Cleveland Shaker Heights PF: While playing at the LeBron James Skills Academy in Las Vegas, Ahmad earned praise from many scouts for his scrappy play. Providence must’ve been one of the schools who was impressed by Ahmad’s play, as they offered a scholarship on Sunday night. Mark Hughes – ’15 Youngstown Ursline PG: Hughes earned his second Division I offer, this time from Wright State, after helping lead DB Hoops to a deep run at the Adidas Invitational. Wright State joins conference foe Youngstown State as D1’s who have offered Hughes. Doug Taylor – ’15 Columbus Northland PF/C: Taylor earned his third offer from a MAC school on Monday, this time from Bowling Green. The big man from Columbus is seeing his stock skyrocket, as he now holds offers from Miami (OH), Ohio University and BGSU. Jarron Cumberland – ’16 Wilmington SG: Jaevin Cumberland’s younger cousin also secured a big offer on Monday when the Purdue Boilermakers called and extended a scholarship. This offer comes after Cumberland was named to the all-star team at the Adidas Unrivaled camp in Chicago. Matt Moyer – ’16 Gahanna Lincoln PF: No Ohio prospect had his phone ring more than Moyer these last couple days. The Columbus area rising junior received new offers from Wake Forest, Virginia Tech, Arizona State, Kansas State and Penn State; giving him five new high-major offers to add to his ever growing sheet. Seth Towns – ’16 Columbus Northland SF/PF: Towns earned yet another Big Ten offer after some strong play at the Reebok Breakout Camp in Philadelphia. This time it was the Iowa Hawkeyes who called to offer, giving Towns another offer from one of the league’s better programs. VJ King – ’16 Fairfax Paul VI (VA) SG: The former Akron St. Vincent-St. Mary’s prospect announced that he will be transferring to the famed Paul VI in Virginia for his next two season, as Ohio is losing yet another elite 2016 prospect to out of state transfer. Also in King news, the talented small forward added an offer from UCLA to his impressive list of offers. Nick Ward – ’16 Gahanna Lincoln PF/C: Like his high school teammate, Moyer, Ward also got some good news this week. In-state program Dayton offered the powerful post prospect, who has seen his stock skyrocket in the last few months. Ward now has multiple Division I offers both at the mid- and high-major levels. Willie Jackson – ’16 Cleveland Garfield Heights SF: After a busy spring and summer playing with both All-Ohio Red and multiple age groups for King James, Jackson continues to attract the interest of some of the nation’s best. The rising junior from Cleveland received a scholarship offer from Iowa State on Wednesday; the most impressive offer to date for the athletic forward.